Anska is a non-hostile Nord bandit wizard you'll meet in High Gate Ruins. She's looking for an old scroll containing proof of her relation to Ysgramor. You can help her clear the dungeon and defeat Vokun during A Scroll For Anska. She usually uses lightning attacks, but also uses fire and ice spells, and is quite capable at higher levels. Standing over several dead draugr, she can be found inside the ruins near the entrance. When you approach her, she'll remark: "You look strong." When you ask her who she is, she'll introduce herself: "I'm Anska. Are you here to help?" She'll elaborate on asking her with which she needs help with: "I've finally located Vokun's crypt! The scroll I'm looking for just has to be here." When you ask her what she needs you to do, she'll remark: "Maybe you could help find it, I just know it's in here." You can now ask her about Vokun, and she'll explain: "Some old priest buried here long ago. I've been searching for his tomb for a few years now." 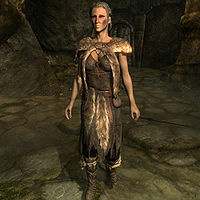 If you ask her what scroll she's looking for, she'll explain: "It's probably meaningless to you, but according to family legend it links our bloodline back to Ysgramor himself." When you ask her what kind of help she needs, she'll admit: "If Vokun is as powerful as I think, I may need a little help um ... dealing ...with him." When you ask her what's in it for you, she'll generously offer anything you'll find in the ruins: "You can have anything except the scroll of course." If you accept her offer, she'll be excited: "Great, with the two of us this should be easy." If you say you can't help, she'll stay in place and remark: "Oh alright. Well I'll be here for a bit if you change your mind." After accepting to help, she will follow you throughout the dungeon. Consequently greeting her will only net you: "This is fun." or "Sometimes I just like to watch them burn." She'll also utter several remarks as you reach certain parts in the dungeon. When you reach the room containing a shelf with several potions and an arcane enchanter among other things, she'll note the following despite the absence of an actual alchemy lab: "An alchemy lab, it could be in here. It's worth a look." Reach the puzzle room, and she'll remark: "This looks like some sort of lever puzzle. We'll have to figure out the correct order to flip them." After one and a half minute real time, she'll add: "Maybe the order has something to do with the Symbols up there." After entering the catacombs, walking through the hall with the spear traps, she will note: "These wall carvings are ancient, we must be getting close." The next room contains a weight sensitive plate with a soul gem on top, the sight of which will urge her to warn you: "That gem looks suspicious to me." When you reach Vokun's throne room, Vokun will rise from his tomb and Anska will add: "That's Vokun, the guardian of the scroll. It must be just past him." When you've taken care of him, she'll remark: "Good riddance. Let's move on, the scroll must be in the next room." And as you enter the next room, the scroll can be seen lying on a table, to which she'll excitingly shout: "There it is! On the table." She'll run towards it and pick it up if you let her. Something something dark side... after which you can ask her what it says: "Let me look. This is a very exciting moment for me. Hmm, it's encrypted. It'll take a while to figure this out." Anska is one of the few NPCs who will not turn hostile if you are a werewolf or vampire, even if you transform right in front of her. 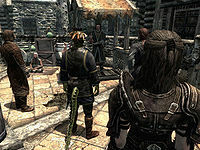 Brynjolf is a Nord, and an important member of the Thieves Guild in Riften. He is initially found at a market stall in the center of Riften selling mysterious red elixirs, although he will usually approach you and inform you that he knows you didn't make all of your money legally. He has a rivalry with fellow merchant Madesi, who doubts Brynjolf's potions are real. Brynjolf will task you with stealing Madesi's ring as an initiation for joining the Thieves Guild. Once you join the Guild, he will move to the guild hall in Riften's Ratway. Brynjolf will later become a temporary follower, along with Karliah, when hunting for Mercer Frey during the Thieves Guild questline. If you spent a little time in Riften, you're bound to bump into Brynjolf, who is likely looking for more recruits to help out the declining Thieves Guild. As a thief, he has an eye for wealth, and will comment on yours when he sees you. If you're carrying 500 gold coins or more, he will assume: "Never done an honest day's work in your life for all that coin you're carrying, eh lad/lass?". However, if you're unfortunate enough to carry less than that, he will deduce: "Running a little light in the pockets, lad/lass?". Either way, you'll respond "I'm sorry, what? ", after which he'll tell you: "I'm saying you've got the coin but you didn't earn a septim of it honestly. I can tell. ", or if you're low on cash: "Your pockets... they're a little low on coin. I can tell." If you ask him how he could possibly know that, he'll explain: "It's all about sizing up your mark, lad/lass. The way they walk, what they're wearing. It's a dead giveaway." The conversation is a bit bugged, since you'll only get to choose from several topics about half of the time. Should you be able to ask him what he means, he'll reply: "Look how you sniffed out my little scheme at the North Gate. You knew it was a shakedown and you called him on it. That's what I'm talking about." In that case, you'll remark he seems well acquainted with wealth, to which he'll get to the point: "Wealth is my business. Help me out and I can add to yours. Would you like a taste? ", after which you'll end up hearing him out. If, on the other hand, you end up remarking that your wealth is none of his business, he'll get to the point: "Oh, but that's where you're wrong, lad/lass. Wealth is my business. Maybe you'd like a taste?". When you ask him what he has in mind, he'll explain: "I've got a bit of an errand to perform, but I need an extra pair of hands. And in my line of work, extra hands are well-paid." If you ask him what he wants you to do, he'll tell you what he wants you to do: "Simple... I'm going to cause a distraction and you're going to steal Madesi's silver ring from a strongbox under his stand. Once you have it, I want you to place it in Brand-Shei's pocket without him noticing." If you're not too keen on breaking the law, and ask him if he's kidding, he'll realize he may have been wrong about you, which is when he'll be disappointed: "Sorry... I usually have a nose for this kind of thing. Never mind then, lad/lass. If you change your mind, come find me." If you decide to ask him why he wants you to plant that ring on Brand-Shei, he'll quickly explain: "There's someone that wants to see him put out of business permanently. That's all you need to know. Now, you tell me when you're ready and we'll get started. ", or if you're in the Bee and Barb, he'll add when you can start instead: "There's someone that [...] need to know. I'll be out in the market all day, from eight in the morning until eight in the evening. Meet me then if you've still got the stomach for it.". Should you leave the conversation at any point, he'll say: "I can take a hint, lad/lass. You want to make some coin, come find me." Should you have refused his offer, he will ask you on seeing you: "Changed your mind I hope? "; and on greeting him, he'll be pleased: "Glad to see you finally came to to your senses. Ready to make some coin? ", after which you can ask him what he wants you to do, as above, or you can refuse again, annoying him: "You're trying my patience, lad/lass." If you happen to be looking for Esbern, who you've found out to be living in Riften during Diplomatic Immunity, you can choose to ignore his observation of your wealth and tell him you're looking for someone hiding out in the city, after which he'll eagerly continue: "Expecting free information, eh? Help me deal with business first, then we'll see how I can help you. Besides, you look like your pockets are a little light on coin, am I right?" If you try to keep him focused on Esbern by telling him you're just looking for information, he'll insist: "And I'm busy. You help me out, and I'll help you out. That's just how it is. ", which will lead to hearing him out. If, on the other hand, you try to persuade him by telling him that dragons are bad for business, you can get two different answers depending on your Speechcraft skill. If you're unsuccesful, he'll tell you that: "Passing on a golden opportunity is worse. ", forcing you to hear him out. If you're succesfull, he'll cave: "Aye, you've got a point there. ", followed by the information you need: "Your guy's hiding out in the Ratway Warrens and paying us good coin for nobody to know about it. Well, until now that is. Tell you what. Go ahead and deal with your business for now. When you're done, find me and we'll deal with mine." If you heard him out, he will be a bit annoyed when he sees you in the Bee and Barb: "What wasn't I clear about?". You can ask him how you're supposed to do what he asked, and he'll be quite annoyed by it: "Do you want me to hold your hand as well? You're going to have to sneak over to Madesi's stall and use your lockpick on the strongbox. Then when you have the ring, you pickpocket Brand-Shei and leave it behind." You can ask him about Brand-Shei again, which will grant you more information this time: "We've been contracted to make sure Brand-Shei remembers not to meddle in affairs that aren't his own. Now, since we're not the Dark Brotherhood, we're not going to kill him, we're just going to make sure he sits in the prisons for a few days." 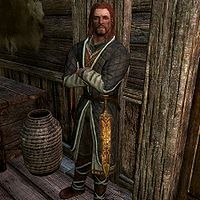 If you got him to tell you about the North Gate guard, you can ask him if he was hired by Brynjolf, to which he'll confirm: "Aye, that he was. And you sniffed him out because he broke one of the cardinal rules of our business... he got greedy. He was told to run the scam on merchants, but he smelled the gold on you and his judgment went out the window." He will add, depending on how you dealt with the guard, either: "Actually, I admire how you handled the situation. You kept your cool and you didn't kill him. That's the mark of a professional thief. ", or "Killing him was a bit... impulsive. A true professional would have kept his cool and dealt with it a different way, but I'll let it go." When you approach him at the market, he'll be ready to do his part of the plan: "Okay lad/lass, ready to make some coin?" When you tell him you're ready, he'll tell you what to do: "Good. Wait until I start the distraction and then show me what you're made of." Brynjolf: "Everyone! Everyone! Gather 'round! I have something amazing to show you that demands your attention!" "Gather 'round all!" "No pushing, no shoving. Plenty of room!" "This way everyone! Over here!" "You need to hear this!" Brynjolf: "The one and only. Mystical beings who live in legends and were masters of great magic. Imagine the power that coursed through their veins!" Madesi: "How did you get that, then? No one's seen them in years!" Brynjolf: "My sources must remain a secret for their own protection but I can promise that the contents are genuine. One sip of the elixir and your wishes will be granted. Great wealth, everlasting life or perhaps limitless power could be yours!" Brand-Shei: "How much does it cost?" Brynjolf: "Only twenty gold septims! Hurry before my supply is gone." "He has to be lying!" "Twenty coins? No one has that much." "He gives other merchants a bad name." "Don't listen to him, he's making this up." "Why would you even listen to him?" "This is ridiculous." "I dunno, sounds like I should try it." "What if he's right? Maybe I'll buy one." "I could get rich and stop selling these trinkets." "This is just what I need right now." "I can't afford to get one, but can I afford not to?" "That Wisp Essence didn't help, but maybe this will." "Grow back that missing limb!" "See into other people's thoughts!" "Learn a library's worth of knowledge in moments!" "Wield powerful magic incantations!" "Live for thousands of years!" "Who knows what powers the elixir will unlock!" "Oh, excuse me, milord/milady. I'll be glad to sell you an elixir after I'm done with these fine people." "When I'm done here, I'd be more than happy to sell you an elixir." "Please, please... hold all your questions until after I've finished!" Brynjolf: "Well, I see that my time is up. Come back tomorrow if you wish to buy." Madesi: "What a waste of time." Brand-Shei: "Damn. I knew I shouldn't have waited." When you approach him at this point, his greeting will depend on how you've faired. If you got caught and arrested by the guards, he'll be disappointed: "I guess I expected too much from you. I didn't think you'd get pinched." If you left the scene or took too long to finish up, he'll ask you: "Just how long did you expect me to keep those people distracted? I had to let the whole plan fall through. Well, at least you didn't do anything stupid. Next time, when you're given a job, don't wander off or take your sweet time." If you've made things rough and ended up killing someone, he'll scold you: "Are you daft? This isn't the Dark Brotherhood! We don't go around murdering anyone, ever. It just isn't how things are done." If you've managed to lose the ring, he'll be a bit annoyed: "Lost it? Well, at least you showed signs of initiative by telling me." In any case, he'll add: "I guess I shouldn't be surprised. Nothing around here has been going well lately." If you've been successful however, he'll be pleased: "Looks like I chose the right person for the job. ", followed by your payment: "And here you go... your payment, just as I promised. The way things have been going around here, it's a relief that our plan went off without a hitch." When you end up asking him what's been going on, he'll tell you: "Bah. My organization's been having a run of bad luck, but I suppose that's just how it goes. ", followed by either :"But never mind that, even though you fouled up the job I still think you've got that spark I'm looking for. There's plenty of gold out there for the taking... if you're up to the challenge." or "But never mind that, you did the job and you did it well. Best of all, there's more where that came from... if you think you can handle it." If you tell him that you're not sure about it, he'll be somewhat annoyed: "Look, I'll make this simple for you. The group I represent has its home in the Ratway beneath Riften... a tavern called the Ragged Flagon." If you reject his offer and tell him what you did was wrong, he'll still try to convince you: "Arrogant, eh? Play it however you want, but listen up. The group I represent [...] the Ragged Flagon. When you come to your senses, find me there and we'll discuss your future." If you tell him you can handle it, however, he'll be content: "All right, then. Let's put that to the test. The group I represent [...] the Ragged Flagon. Get there in one piece and we'll see if you've really got what it takes." When he's told you where you are to meet him, he'll head down to the Ragged Flagon awaiting your arrival. If you manage to speak to him before he leaves, you can ask him how to find the Ratway, which will annoy him greatly: "If I have to hold your hand through everything, maybe you aren't cut out for this kind of work. It's under your feet, lad/lass. Just follow the smell." If you ask why you can't talk out in the open instead, he'll explain: "The walls have ears and you're being tested, lad/lass. We'll talk in the Ragged Flagon." "Well what do you call that then!" Vekel: "Give it up, Brynjolf... those days are over." Brynjolf: "I'm telling you, this one is different..."
Dirge: "We've all heard that one before, Bryn! Quit kidding yourself." Vekel: "It's time to face the truth, old friend. You, Vex, Mercer... you're all part of a dying breed. Things are changing! Brynjolf: "Dying breed, eh? Well what do you call that then!" He'll greet you with: "Well, well... color me impressed, lad/lass. I wasn't certain I'd ever see you again!" Your answer will net you another task, but you have three possible replies. If you tell him getting here was easy, he'll compliment you: "Reliable and headstrong? You're turning out to be quite the prize! So... now that I've whetted your appetite with our little scheme at the market, how about handling a few deadbeats for me?" If you exclaim you've could've gotten killed, he'll scold you: "No risk, no reward. That's the way it goes, so you better get used to it. Now... if you're done bellyaching like a child, how about handling a few deadbeats for me?" If you remark the place looks like a mess and you shouldn't have bothered getting there, he'll be irritated as well: "If you were expecting a palace, then maybe you're not cut out for this line of work. Our methods involve secrecy and discretion. Now... if you're done bellyaching [...] deadbeats for me?" When you ask him what the deadbeats did, he'll explain: "They owe our organization some serious coin and they've decided not to pay. I want you to explain to them the error of their ways." Subsequently, you'll say the job sounds good and ask him who they are, and he'll clarify: "Keerava, Bersi Honey-Hand and Haelga. Do this right, and I can promise you a permanent place in our organization." When asked how you should handled it, he'll admit: "Honestly, the debt is secondary here. What's more important is that you get the message across that we aren't to be ignored. A word of warning though... I don't want any of them killed. Bad for business." If you tell him to consider it done, he'll be pleased: "Good. If you need any details on your marks, I'll be here. Now get going." Or you can greedily ask him if you'll get a cut, which will slightly annoy him: "Of course you'll get a cut. We take care of our own. Now if you need any details on your marks, I'll be here. Get going.". In any case, he'll end the conversation with: "I'll be here when you're done.". Not completed "He's as pig-headed a man as you'll ever find. The key is that ugly dwarven urn in his shop. Smash that thing to bits and he'll change his attitude." Completed "I wasn't sure that he'd see the light, but I'm sure you "explained" it to him. Well done!" Not completed "Keerava's stubborn, but she's got a soft spot for family. Talk to Talen-Jei at the Bee and Barb and see if you can get something out of him. They're... well acquainted if you catch my meaning." Completed "She was the toughest of the bunch. Honestly, I'm amazed she didn't kick you out of the Bee and Barb herself." Not completed "Haelga is a devout follower of Dibella and dotes over the statue to the Divine that she keeps at the Bunkhouse. Use it as leverage and she'll cave." Completed "She's as stubborn as she is beautiful, isn't she? Glad you found a way to get her to pay." 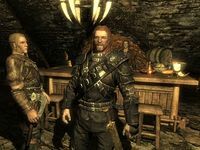 Upon completing the Thieves Guild questline, Brynjolf will constantly repeat the same line of dialog, and will no longer be open for interaction. This page was last modified on 14 August 2017, at 05:21.